The Jacobsen Raven Envizio Pro II XP Sprayer has been hitting all the right notes with superintendents across the globe since its release last year. Among those impressed by Jacobsen’s new addition is Rodney Cook, superintendent of 20 years at the picturesque Grand Golf Course on the Gold Coast. Since receiving the Raven GPS equipped machine last December, Cook and his team have been using it non-stop and are impressed by certain functionalities, particularly the versatility of the spray nozzles. He believes it is more user-friendly than conventional machines and outshines them in several key areas. “We really like it. Going from an old conventional sprayer to the GPS technology has been good,” Cook said. “The old types of machines require you to turn your triplet nozzles, and then it’s a volume thing e.g. blue nozzle puts out 400 L/ha, Yellow puts 600 L/ha and a red nozzle puts out 800 L/ha etc. “The Jacobsen XP E-Pro has twin nozzles on the boom, back to back. 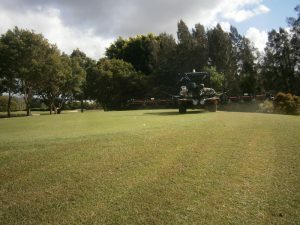 Using the Capstan Sharpshooter, we can change the nozzle droplet micron size on the run if it gets too windy without leaving the operators seat, in conjunction with the Raven GPS the output stays at the desired rate, unlike the previous triplet set up, where you had to stop spraying and reselect nozzle size whilst accepting a change in volume output”. 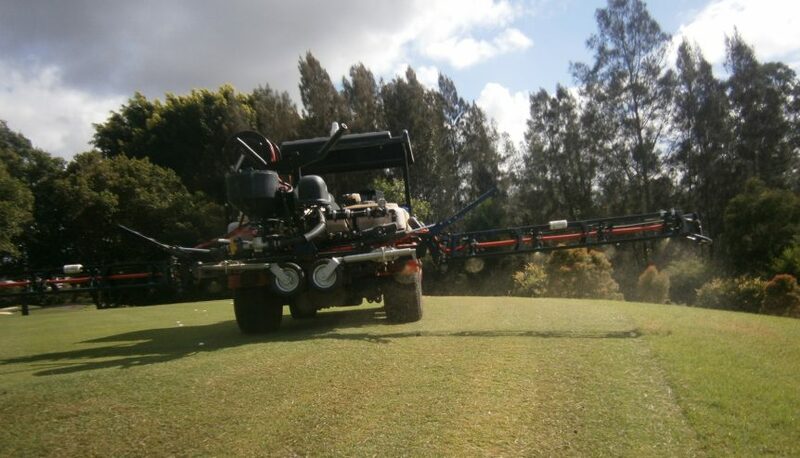 Another key feature of using GPS guided spraying is the ability to save superintendents time and money. Cook said he is surprised by the amount of product the GPS system has saved across its 10 months in operation so far. The GPS system maps the area already sprayed, “It knows where you have sprayed and you can see it on the map on your screen, so if you go over an area that you’ve sprayed, the nozzles will not come again eliminating over application,” Cook said. Cook said the machine has allowed both he and his grounds team to operate more efficiently and complete jobs in a timely fashion. “Time wise, we’ve probably gained half to three-quarters of a day per fairway spraying application,” he said. 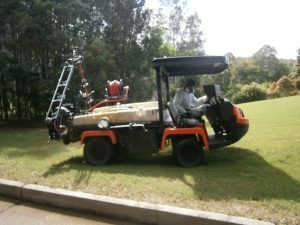 The Jacobsen EPro XP Sprayer can be used as more than a vehicle for dispensing pesticides and other liquid products. Cook said this versatility is particularly valuable during renovation periods. Cook is also pleased by the EPro XP’s ability to operate in the kind of conditions that superintendents are expected to cope with on a daily basis. Article written for Jacobsen by Jordan Crick.